Following a rash of suicides, workers at the Foxconn Shenzhen factory have a shot at a raise. Another one. This is the most recent pay increase at a factory complex that has garnered internationally attention for its workers jumping to their death. Foxconn manufactures the iPhone, the iPad, the Xbox 360, the Wii and the PS3. In late March, Foxconn workers received a 20 percent pay increase. The company claimed that the raise was not in response to the recent suicides, but planned. That figure then increased to a 30 percent raise, bumping wages from the equivalent of US$130 to $175 a month. It was even rumored that Apple was chipping in. Now, Foxconn is offering a performance-based 66 percent pay increase. Sixty-six percent! In order to receive the $292 per month salary, the workers must pass a three month performance review. What exactly that review entails isn't yet known. "This wage increase has been instituted to safeguard the dignity of workers, accelerate economic transformation, support Foxconn's long-term objective of continued evolution from a manufacturing leader to a technology leader, and to rally and sustain the best of our workforce," said Foxconn founder and Chairman Terry Gou in a statement, reports Reuters. "We are working diligently to ensure that our workplace standards and remuneration not only continue to meet the rapidly changing needs of our employees, but that they are best in class." 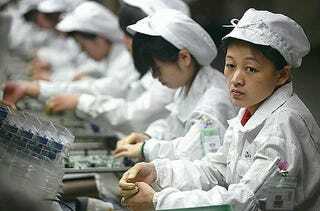 Earlier this month, a Foxconn worker dropped dead after apparently completing a 34-hour factory shift. Foxconn has denied this claim, however. Apple exec Steve Jobs contends that Foxconn is "not a sweatshop". Another Foxconn employee has died. However, it was not by suicide.